I spotted some of the cutest-ever eggplants at Union Square Greenmarket. They had an adorable name to match … fairytale eggplants! So, I brought a big bagful home and this is the first recipe I created! 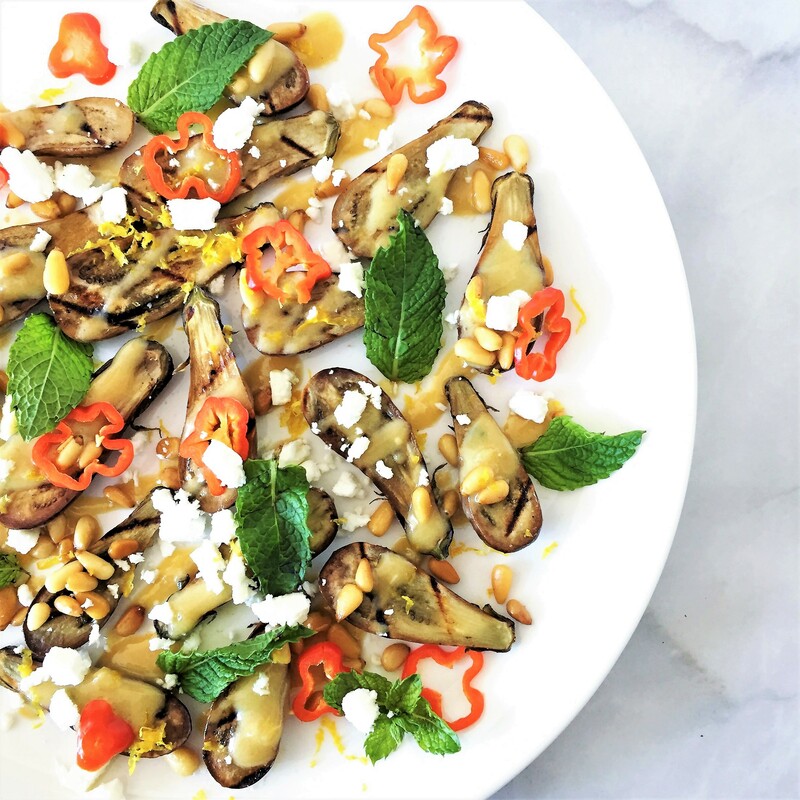 It’s a Middle Eastern-inspired warm grilled eggplant appetizer. (Though, I actually ate the entire platter at once as an entrée!) I hope you can find these itty-bitty eggplants so you can fix this dish. But if not, do try it with baby zucchini, baby pattypan squash, or just slices of regular or Italian eggplant. Serve it at a special meal for two—or anytime. And do enjoy on Meatless Monday. Hope you like it as much as I do! Why it’s good for you? 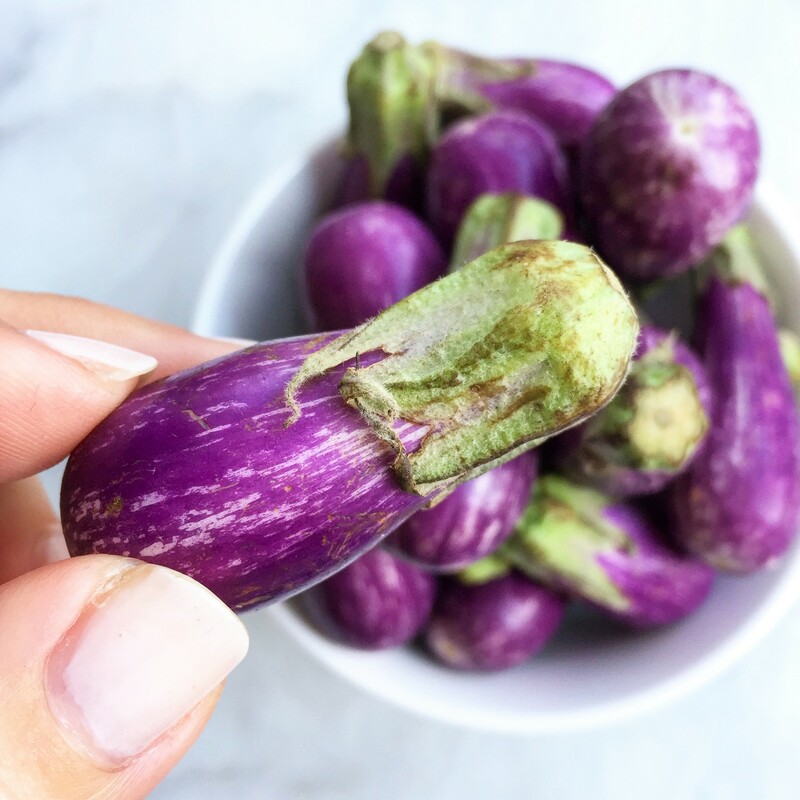 Eggplant peel contains a powerful antioxidant; specifically, it’s an anthocyanin called nasunin! In a liquid measuring cup, whisk together the tahini, 1 tablespoon of the olive oil, the lemon juice, garlic, and a pinch of the sea salt. Set aside. Halve the fairytale eggplants lengthwise. Brush the cut surface with remaining 2 teaspoons olive oil. Grill on both sides over direct medium-high heat until rich grill marks form, about 10 minutes total. Arrange the grilled eggplants on a large plate. Sprinkle with the remaining pinch sea salt. Drizzle with the lemony-tahini dressing. 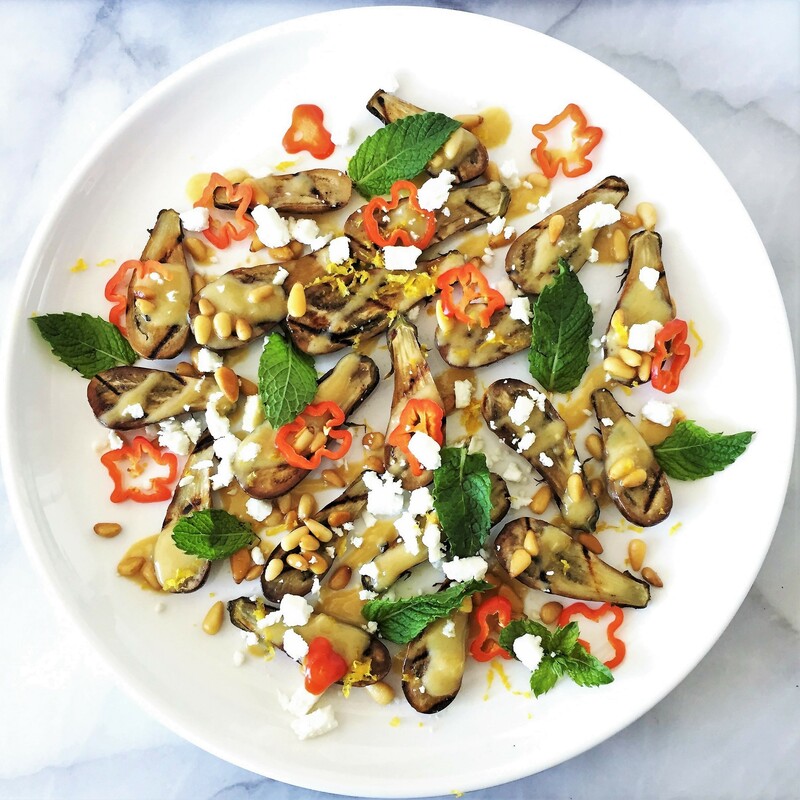 Garnish w/the lemon zest, hot pepper, pine nuts, mint and, if desired, feta cheese. Enjoy! *Alternatively, use round slices of regular or Italian eggplant. Or try with baby pattypan squash or baby zucchini. When creating a new recipe from scratch, be sure to plan for various colors, such as red from hot pepper, green from mint, yellow from lemon zest, and even white from feta cheese. Plan for various textures, too, like tenderness from eggplant and crunchiness from pine nuts. Finish with aromatic ingredients, such as lemon zest and fresh mint. Don’t forget a little salt … especially if you’re starting with a main ingredient that has little or no sodium, such as eggplant.